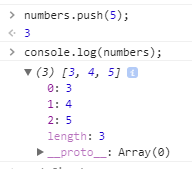 If output the array in the console you will see that there are 3 elements now with 5 being the last element in the array. 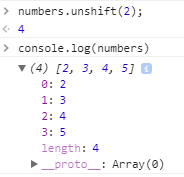 The opposite of shift() is the pop() method, the pop() method will remove the last element in the array. 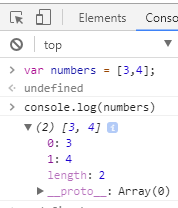 If you output the array in the browser console now you get have only one element remaining which is the element with the value 4. There's something interesting when using the delete keyword. Even though we deleted the number 3 successfully. 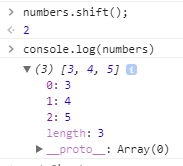 The length of the array is still 2, meaning there's an empty element occupying the first element of the array. So when you using the delete keyword there's some residual side effects that you would normally think about. It's almost like a soft delete. Not bad this is surely nice way to add and remove in simple and easy method.